Before you zero in on the rust stain, it's a good idea to give the entire surface a basic cleaning. 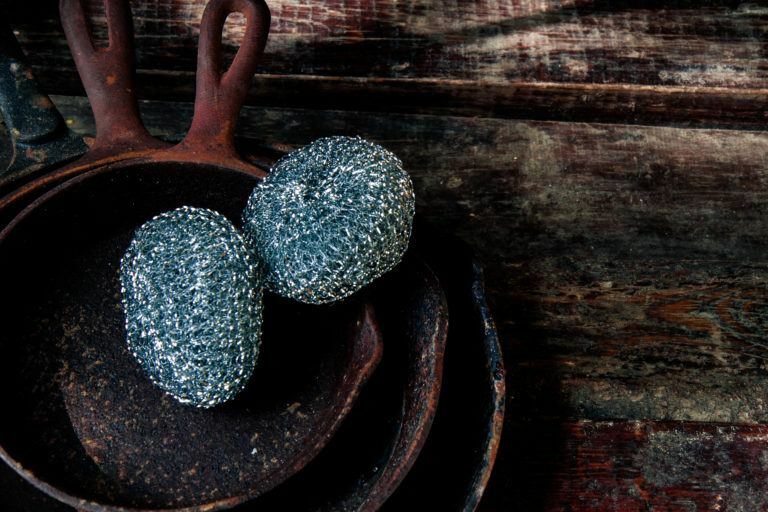 All you really need to remove rust from a hard surface is a plain pumice stone. Start by running the pumice stone under some warmish water. Next, scrub at the rust stain with the damp pumice stone. Occasionally check your progress by running some water over the area you're cleaning. 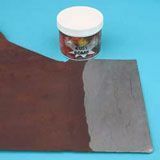 This simple, inexpensive rust removal method should take care of most?if not all?of the rust on a stained surface. Rust is like a supervillain of stains. It’s ugly, it often seems to appear out of thin air, and it’s tough. In fact, it’s one of the few stains that can’t, in a pinch, be erased with chlorine bleach. Get this: chlorine bleach actually makes rust stains worse. Of course, if you’re like us here at How to Clean Things, you avoid using bleach anyway, so this is one of those times when being considerate of the environment pays off immediately. Before you start having nightmares about rust stains, let’s slow down and think about this rationally. Everyone knows a supervillain always has a fatal weakness, and rust actually has a few that are natural and nontoxic. Which one you’ll try depends on the kind of material you need to clean, whether the surface is (or can be made) horizontal, and whether it can be kept dry for the duration of the cleaning. Since the worst rust stain in my life was on a vertical portion of my bathroom sink, I chose to use the simplest and most reliable method of cleaning rust off of hard surfaces. 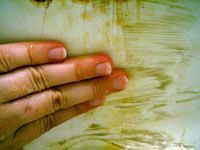 If your needs are different, check out the sidebar or scroll to the bottom of the page, where I describe a method for getting rust stains out of fabrics. Before you zero in on the rust stain, it’s a good idea to give the entire surface a basic cleaning. If the surface is a sink, I recommend simply spraying it down with some undiluted white vinegar and giving it a once-over with a scrub brush. 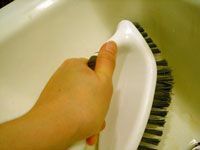 The vinegar will naturally disinfect the sink and dissolve any residues that could get between you and the rust stain. Whatever you do, don’t use bleach or any bleach-containing products on rust; chlorine bleach can actually set rust stains. 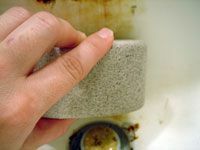 All you really need to remove rust from a hard surface is a plain pumice stone. 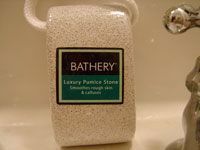 I picked one up in the beauty section at Target, since pumice’s most common household use is scraping crusty old skin off people’s feet. I think my use for it is less disgusting. Start by running the pumice stone under some warmish water. Pumice is a porous volcanic rock and will absorb some of the water. This softens the stone slightly, making it more effective as a rust remover and less likely to scratch the surface while you clean. Next, scrub at the rust stain with the damp pumice stone. 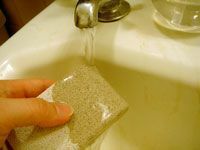 Because pumice is such a soft rock, it won’t scratch most surfaces, but it’s still a good idea to use gentle pressure. It isn’t necessary to scrub very hard, anyway; the pumice does most of the hard work on its own, so you should quickly notice the rust stain lightening. Occasionally check your progress by running some water over the area you’re cleaning. The damp pumice will rub off on the stained surface, leaving behind a thin coating of what is basically mud. If this doesn’t wash away with water alone, use your fingers or a rag to wipe it off. 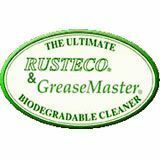 When the rust stain has fully disappeared, give the formerly stained area a last thorough rinse. This simple, inexpensive rust removal method should take care of most—if not all—of the rust on a stained surface. My bathroom sink is pretty much doomed, to the point that I would replace it if I weren’t renting, so I don’t think any method in the world could get it completely rust-free. That said, I was thrilled with the results I got with just a pumice stone. The “after” picture is to the right. Acids dissolve rust, so most products designed to remove rust are acidic. Unfortunately, acids sometimes also dissolve other things. Things you don’t want dissolved. Like fabric. So if you leaned up against a rusty railing in your favorite shirt, your best bet is a gently acidic solution of lemon juice and salt. Even still, exercise caution: don’t use this on delicate fabrics, and spot test the method on a hidden section of the fabric to make sure it won’t discolor or otherwise damage it. If you decide it’s safe to proceed, set the fabric out flat on a clean surface like a counter or the top of a washer or dryer. Cover the rust stain with a small pile of table salt, then squeeze lemon juice over it until it’s soaked through but not too liquidy. To ensure you get the right consistency, you could put a little lemon juice in a bowl and add salt until you have a paste, which you can then spread on the stain. However you get the lemon juice and salt on the stain, make sure it sits there for at least half an hour before you rinse it out with cool water. If the lemon juice and salt haven’t done their job by then, just apply a fresh mixture and let it sit for up to several hours. This method works on hard surfaces, too, but only if they’re oriented horizontally and will stay dry. I tried it in the basin of my bathroom sink, but a drippy faucet washed away the salt and lemon juice paste while I waited for it to work. 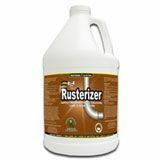 Rusterizer is an organic, biodegradable liquid rust cleaner that is safe to use on almost any surface, including fabric. It can also be used to remove calcium and lime deposits. You can find it on Amazon. A homemade paste of hydrogen peroxide and cream of tartar can be used to remove rust stains from fabrics or hard surfaces. 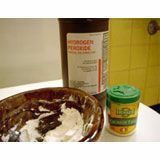 Simply pour a couple tablespoons of hydrogen peroxide into a bowl and add cream of tartar until it forms a thick paste. Spread the paste over the rust stain and let it sit for 30 minutes. The acid in the cream of tartar and the oxygen bleach in the peroxide should ensure that when you rinse the paste away with water, it takes the rust with it. Rust Bomb, another nontoxic and biodegradable rust remover, is a gel that can easily be used on either horizontal or vertical surfaces. Rusteco is manufactured from plant-based and food grade ingredients to ensure that it is safe for both people and the environment. It’s available in both liquid and gel forms to suit your needs, and contains a rust inhibitor to protect surfaces from future stains.